James Joyce completed his novel, Ulysses, on October 30, 1921. Ninety years later, on October 30, 2011, Charlene Matthews, the Los Angeles-based book artist and bookbinder recently the subject of a profile in Studios magazine, began work on an extraordinary edition of the book, based upon Sylvia Beach's true first edition with all its typos included. 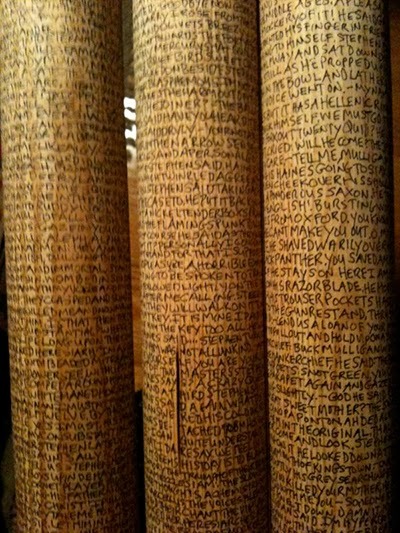 Two years later, on October 30, 2013, she completed it: the entire text of Ulysses - all of its approximately 265,000 words in eighteen episodes - transcribed by hand onto thirty-eight seven-foot tall, two-inch diameter poles: Ulysses as a landscape to physically move through; the novel as literary grove, Ulysses as trees of of life with language as fragrant, hallucinatory bark, and trunks reaching toward the sky. Head over to Booktryst to look over a gallery of images and learn more about Matthews' grand undertaking. And if you'd like a nice introduction to Ulysses, please see some of the instructive material we've listed below.